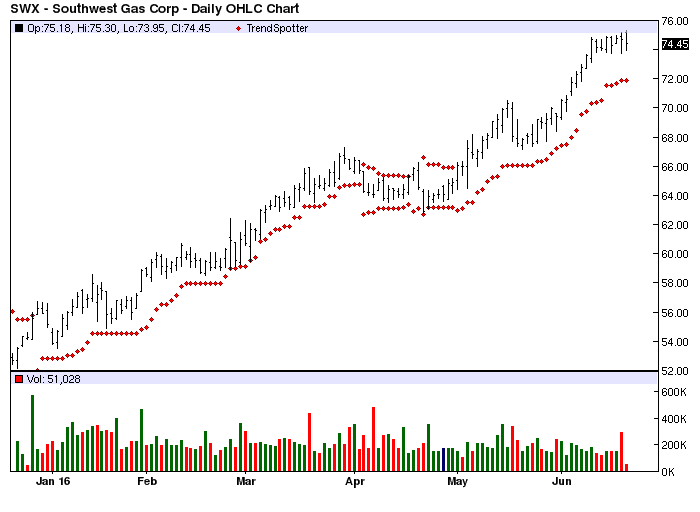 The Chart of the Day belongs to SouthWest Gas (SWX). I found the gas utility stock by using Barchart to sort today's All Time High list first for the most frequent number of new highs in the last month, then again for technical buy signals of 80% or more. Next I reviewed the charts for consistency using the Flipchart feature. SouthWest Gas is principally engaged in the business of purchasing,transporting, and distributing natural gas in portions of Arizona, Nevada,and California. The Company also engaged in financial services activities,through PriMerit Bank, Federal Savings Bank (PriMerit or the Bank), a wholly owned subsidiary.